“La Péri by Leon Bakst” collection has been released for the exhibition of the famous theater artist Leon Bakst. Limited edition souvenirs and merchandise launched to mark various events and exhibitions can be found in nearly any museum shop in the Russian capital. Here are five suggestions for original gifts to take back with you from a trip to Moscow. Masterpieces from the Tretyakov Gallery can now be literally thrown over the shoulder. Russian brand Radical Chic has released a limited series of silk scarves under the title of Art Edition, reproducing the works of great Russian artists. The collection includes a sketch of a costume by Léon Bakst for the drama Salome by Oscar Wilde; House of King Berendei – a sketch by Viktor Vasnetsov of the scenery for Rimsky-Korsakov's opera TheSnow Maiden; Moscow. Red Square by Wassily Kandinsky; Café Chantant by George Yakulov; Asters by Aristarchus Lentulov and Formula of the Universe by Pavel Filonov. 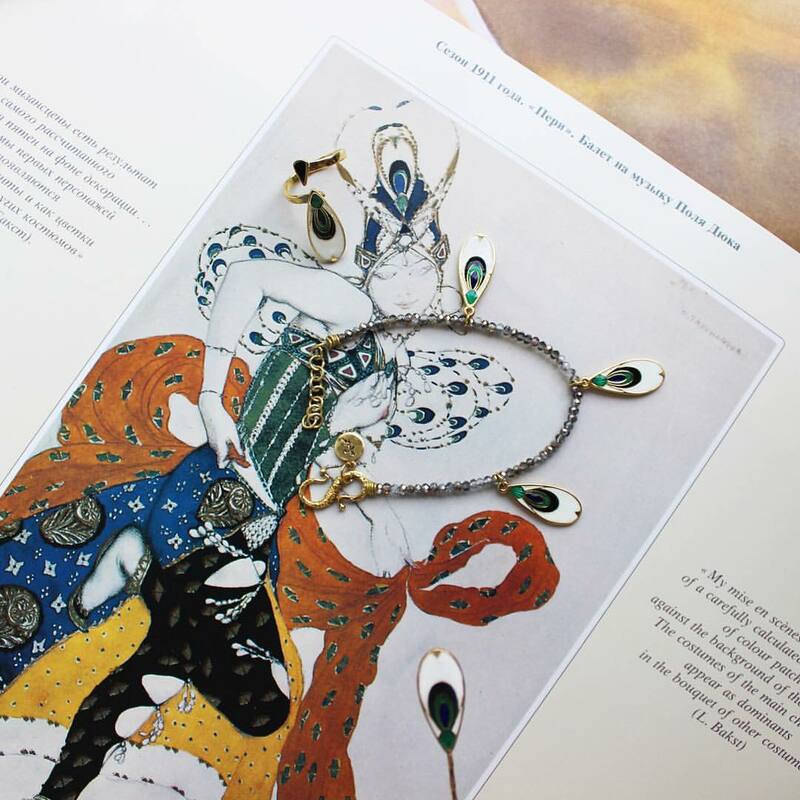 The new collection “La Péri by Leon Bakst” has been released for the exhibition of the famous theater artist Leon Bakst, who painted scenery and costumes for Sergei Diaghilev’s "Ballets Russes" in France and the United States. It is inspired by the costume for the 1911 ballet La Péri, based on the stories about a Peri, a character from oriental tales. The collection includes earrings, rings, necklaces, brooches, pins and bracelets. For each exhibition the Garage Museum of Contemporary Art prepares a special collection of gifts, often involving the artists themselves in the creation of the souvenirs. The two current exhibitions – one by Swiss artist Urs Fischer and one titled “Co–Thinkers” – are no exception. Fischer himself invented and sent a sample of one of his prints, which later was used for the production of a limited edition of bags and sweatshirts. For “Co–Thinkers,” which is running as part of the museum’s inclusive program, the store presents a series of T-shirts with the inscription “GARAGE” in Braille. For the shop at Moscow’s Jewish Museum, designer Julia Kalmanovich, in collaboration with the artist Denis Semyonov, has created prints for a limited collection of sweatshirts, which are based on the works and sayings by legendary Jewish artists, cultural figures and scientists, including Marc Chagall, David Ben-Gurion, Albert Einstein and others. Specially for the Moscow Museum of Modern Art the Russian designer Katya Dobryakova has created a series of funny sweatshirts with “eyes.” Although they resemble a print with eyes by Comme des Garçons, the designer claims that she took works by the Russian artist Proteus Temen as the basis for the sketches. Anyway, these life-affirming garments are certainly popular with hipsters. Additionally, in September MMOMA will launch one more limited edition of T-shirts and skates featuring the edgy pictures of another artist – Valery Chtak.